At London Drugs, we’re proud to offer our customers expert advice. In this #LDExperts article, guest author & Photolab Manager Meghan shares her intel on how to simplify the passport photo process – for you and for your kids. So you’ve decided to travel and you want to bring your kids with you. Good for you. I can’t say that I understand it, but know that you have now transcended to the next level of parenthood. I take hundreds of passport photos. Hundreds. Maybe even thousands. I know over the last ten years or so that we’ve been offering them, it must add up to a LOT. We started out with a digital camera that was the size of my head, manually sizing your passport photos by matching some certain key features (eyes, chin, crown of your head) with lines on the screen. But now, we’ve graduated to using a DSLR with a tablet that does most of the sizing work for us. Thank goodness! So adult passport photos can be taken in the blink of an eye. 1. Do NOT tell your child not to smile. Okay. We all know that you’re not supposed to smile in a passport photo. I don’t know about you, but if I tell my children not to do something, it’s the FIRST thing they will do. We have culturally trained our children to smile for a camera. They’re going to want to do it. But here’s what you can do. You can tell them to remember to keep their mouth closed if you really want to… but the easiest way to get them not to smile AND to keep their mouth closed is to ask them to hum. That’s it. Bonus points if you can get them to hum a song they have recently learned. When they are focused on humming the song they will automatically close their lips and forget to smile! 2. Ask your child to put their hands on their hips. This accomplishes two things. It keeps their hands busy for one – and we all know kids need something to keep their hands busy at all times, or they will find a way to DESTROY something. But it also spreads out their shoulders and makes their upper body appear bigger, which helps to block the back-flash and allows their skin to be properly exposed in the photo, and usually also positions them square to the camera. 3. Dress your child in a dark shirt. Unless you want to know what your child looks like without a body, you’ll want to dress them in something that will give some contrast against a white background. When a strong flash hits a child with a white shirt on a white background, funny things happen, and those photos are destined for rejection at the passport office. 4. Dress your infant in an open shirt or onesie that you can easily unsnap. If your child is small enough that they need to sit on your lap, your hands cannot appear anywhere in the photo. Pro tip: put your hands under your child’s shirt to support them. Even if your hands are in the photo they will be covered by clothing, and nobody but you and your baby will ever know! 5. Please. Please please please. Do NOT bring your child in at nap time. Or lunch time, or bed time. If your child is not cooperating for you, there’s a good chance they’re not going to cooperate for us either. If you have to do this I get it. Sometimes it can’t be avoided. Sometimes you’re in a hurry and need something now. In that case, be prepared to stand behind me and make silly faces by my ear to grab your child’s attention. Or be prepared for bribery. This works about 50% of the time. I promise I won’t hold it against you, but I guarantee we’ll all be a little happier if you bring in a well-rested and satiated little human for passport photos. 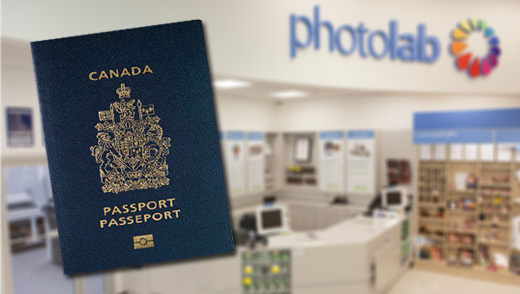 You can get more information on passport photos and requirements from the London Drugs website and also Service Canada. Good luck in your travels! I can’t wait to see your photos when you get back!! Meghan is a meal-planning, food-prepping, Pinterest addict. She likes coffee – a lot. A mom of 2 boys, Meghan has a Bachelor of Arts with a major in Psychology, which she uses on a daily basis when helping customers create memories. Meghan is honoured to witness your histories unfold in real-time. Known as “a social media pro,” LDExpert Meghan blogs about her experiences as Photolab Manager at www.ldlablady.wordpress.com. You can also follow her on Twitter.